Fill out your profile. We want to get to know you! 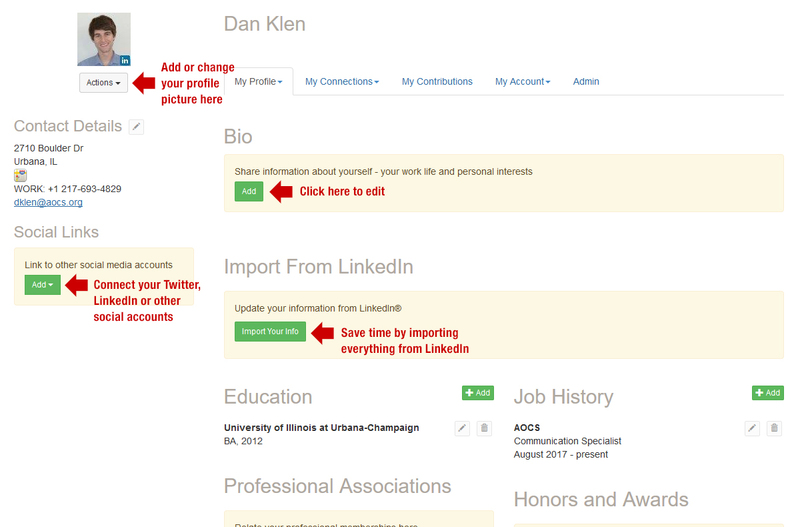 You can either fill out your profile manually, or you can import your information from LinkedIn. Be sure to fill out your Job History, Education, and other areas — these will help your like-minded peers find you. Uploading a profile picture and a bio that shows your personality is a great way to ensure you make a good impression in the community. 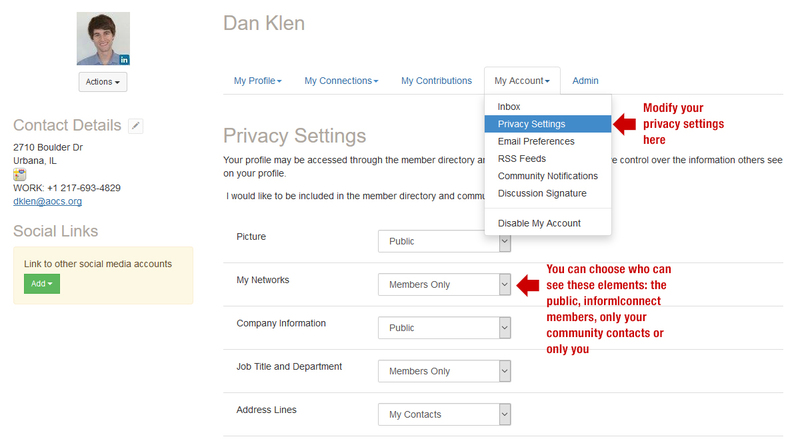 Customize your profile settings. Start by finding My Account in your member profile. 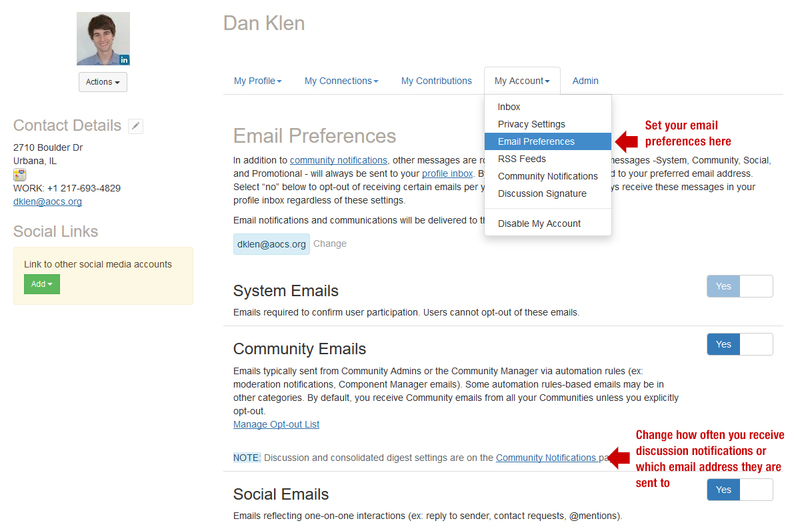 From here, you can set up how you want to receive emails from the community, how much of your profile you want visible to other members, the signature area that appears under your discussion posts, and more. If you have questions about what a certain setting means, please email informconnect@aocs.org for help. PRO TIP: We recommend subscribing to receive emails as a Daily Digest — you will receive a single email each day summarizing the hottest topics in your community. You can also get emails in real time — perfect for the power users or anyone who likes up-to-the-minute alerts on what is going on. What now? It is time to join the conversation! Let us know you are online. Say hello and share what you are hoping to gain by participating. Ask questions. What do you want to know more about? Have a question about anything from professional development to everyday problems? There is someone out there with the answer. Share ideas. Is there a hot topic you want to discuss? How about a lesson you have learned that might help your fellow members? Start a discussion thread to give others a peek inside your world or to demonstrate your expertise on a topic. Give feedback. Use your knowledge and experience to answer other members' questions. Just click "Reply to Discussion" to the right of any discussion post, or comment underneath a library entry. Spread knowledge. Upload useful resources to the inform|connect library, check out what others have uploaded, and keep the sharing going.